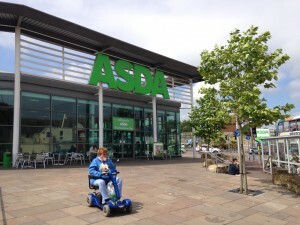 Lair of the Saurian: An exploration of Asda’s Jurassic Car Park | Unofficial Britain. Superstores and their car parks are generally considered non-places, like budget hotel chains, storage facilities and motorway service stations. It doesn’t matter where in Britain you are, the Premier Inn, IKEA, Tesco, Roadchef or Big Yellow Storage remain consistent. 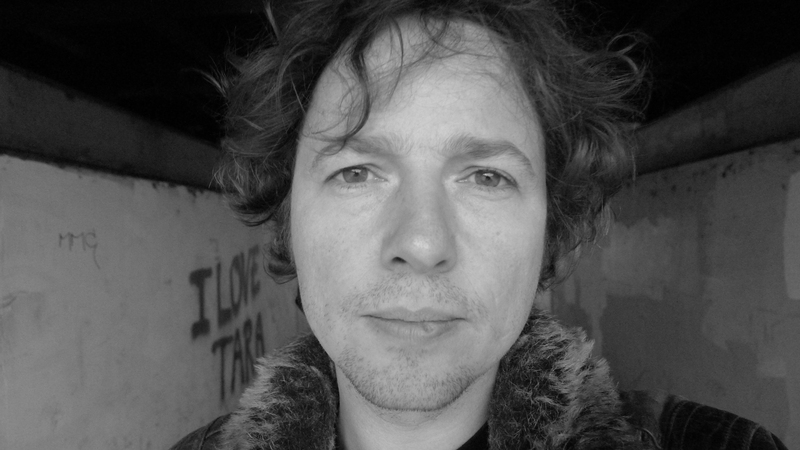 They transcend geography, retaining their distinctive architecture, décor and narrative logic, much like Britain’s imperial outposts during the age of Empire. Recently, it occurred to me that my only experience of a superstore car park was as a customer with a car. I’ve never treated the car park as a pedestrian destination. 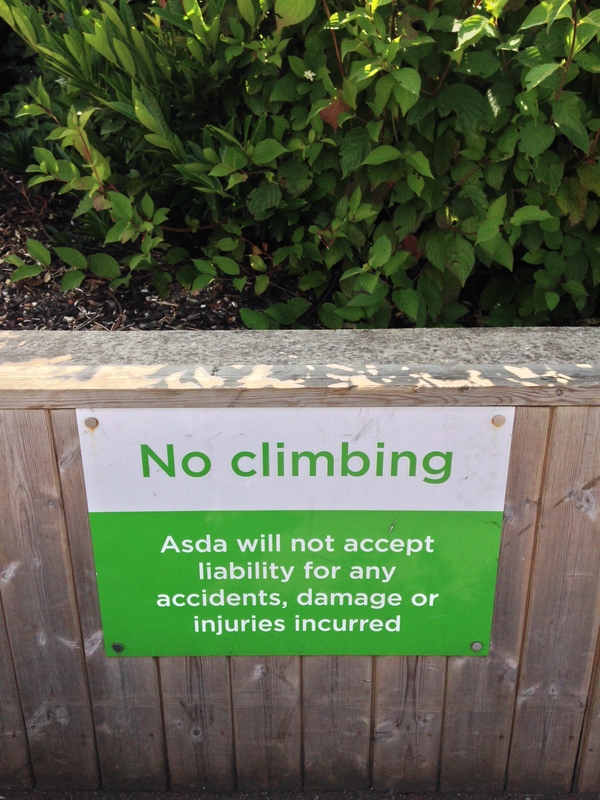 To remedy this, I set out on foot for the ASDA in Silverhill, Hastings with absolutely no intention of entering the store itself. The approach is as expected: the green and glass frontage of ASDA looms large over the bus stop. 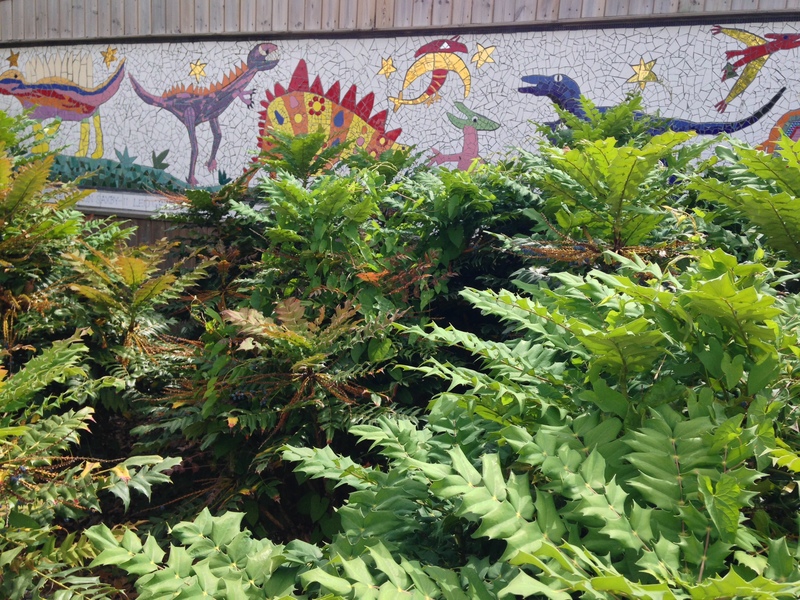 But to the left I’m surprised by a frieze depicting dinosaurs, created as part of a ‘Community Inclusion Project’. Hastings was once a treasure trove for dinosaur hunters. The Victorian seaside boom transformed the struggling fishing town into a hugely popular seaside destination. The town of St Leonard’s was built as a new resort for the more ‘high end’ influx of holidaymakers. During the extensive quarrying and digging, many fossils were discovered. In particular, that of Iguanodon, the large, spiky thumbed herbivore which – in my dinosaur books – was always pictured being attacked by a carnivorous dinosaur, so I was never a fan. Incidentally, three of the Iguanodon specimens were discovered by Charles Dawson, who would later become notorious for a series of archaeological hoaxes, culminating in the Piltdown Man, which for 30 years was considered ‘the missing link’, even though it was, essentially, an orang-utan’s jaw wedged into a human head. Silverhill is a suburb on the A21 approach, which is also a junction, one road leading down to St Leonard’s, the other continuing into Hastings. During the 19th Century there was a lot of development here, which bore spiky dinosaur-shaped fruit. In celebration of Silverhill’s Saurian lair, there’s a prehistoric theme running through this ASDA carpark. 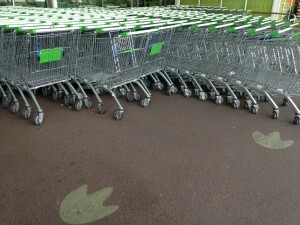 Big green Iguanodon prints stalk a herd of shopping trolleys huddled by the cash machine. Rocks are piled near the entrance. 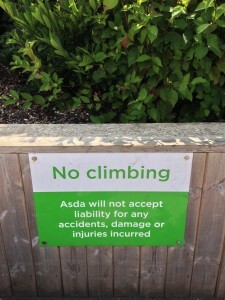 This wild aesthetic has clearly come at a cost to ASDA’s health and safety policy. 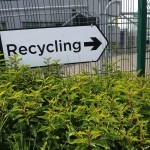 The car park borders warehouse depots for vacuum cleaner parts, but to distract you from this, there are pockets of luscious vegetation around the outskirts – tall plants growing behind low wooden fences, rocks piled between wooden slats. They look alluring, but signs warning against the perils of climbing. Yes, this is a place of tasty foodstuffs and convenient parking, but it is also a wild place where death shows no mercy to the overly curious. 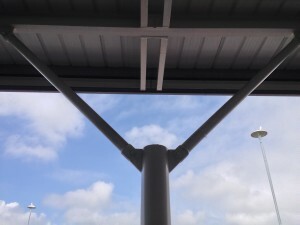 Even the supports of the superstore look like trees, with mobility scooters weaving beneath, laden with produce. Three ageing ape men sit hunched in a row by the sliding doors, intently smoking. I head past the click & collect ‘drive thru’ with its crudely primitive spelling of the word “through”. Christ alive! What kind of monsters lurk here? 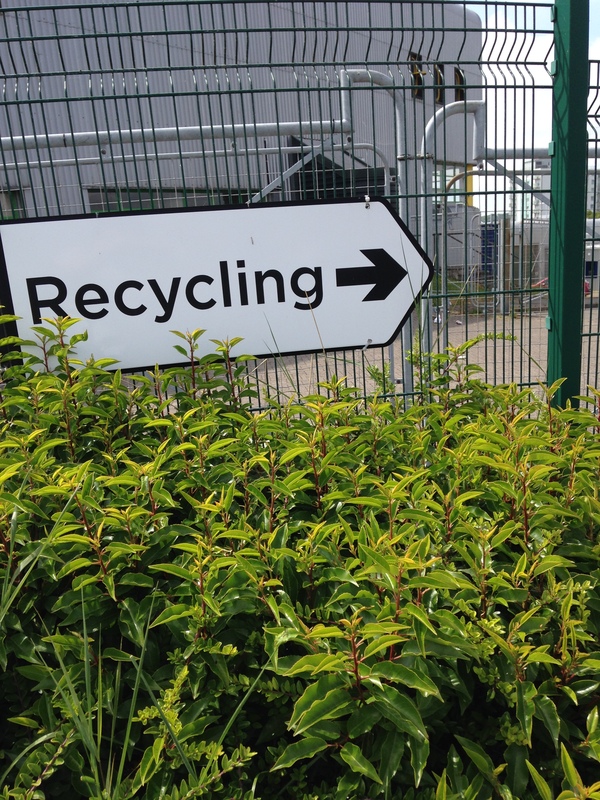 There’s a series of recycling bins in a cul-de-sac that would be hard to discover if you didn’t know it was there. The signs for it are wonky, embedded in foliage. Deeper into the car park, random trolleys have become separated from the herd. 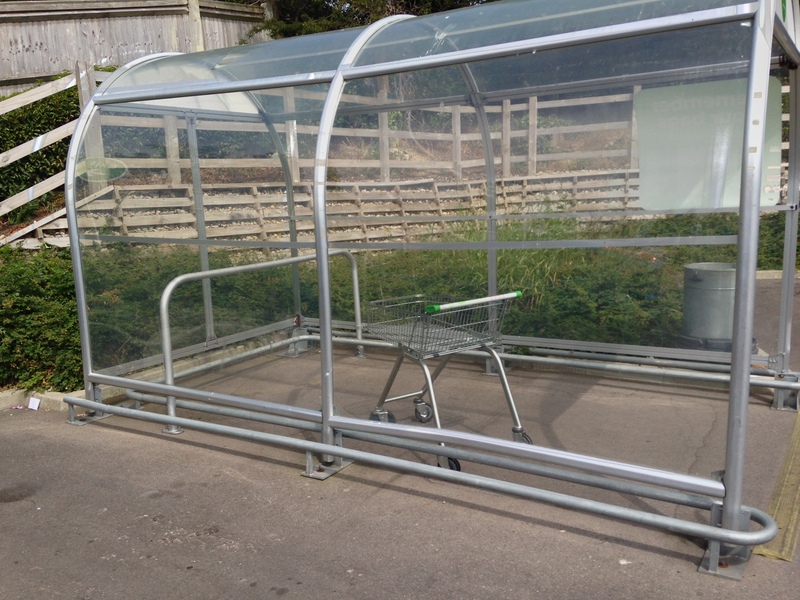 There’s a single trolley alone behind glass at the far reaches of concrete, where even the incessant zebra crossings and ziz-zags run out of steam. It broods over the fence that shuts it into this hellish open prison. It seems to be taking some time out alone to plot the coming revolution. In this zone, the car park loses its Jurassic edge, especially as I circle past the Hand Car Wash. It becomes much like any other superstore car park . 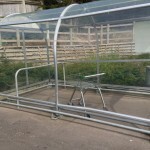 Namely – tarmac, white markings, trolleys and cars. 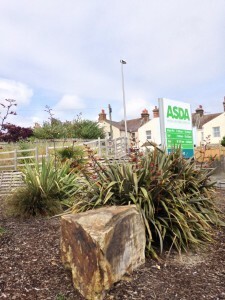 But the designers really bring the theme back into focus by the fire assembly point near the Asda sign on silverhill road. Here is a verdant wedge of landscaping. Ancient boulders are strewn between big plants with green fronds and forest floor wood chippings. Oh, yes, now we’re really hurtling back through the aeons! Here I can well imagine the Iguanodons assembling, grunting, sniffing the scent of freshly warmed bread and fish at the brink of its sell-by date. 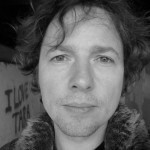 Stubbing out their gigantic cigarettes, and checking their wallets for cash, they slowly approach their favourite feeding ground. This is not a generic Asda car park, this is the lair of the Saurian. Clamber here at your own peril. I sometimes drive into that car park to turn round. It has always always been a scary experience, next time perhaps i’ll have more understanding of why. Thanks. In the future they may dig in the Silverhill area and find the fossilised remains of cars which failed to re-emerge from their turning attempt in Asda’s car park. A death pit of metal bones.